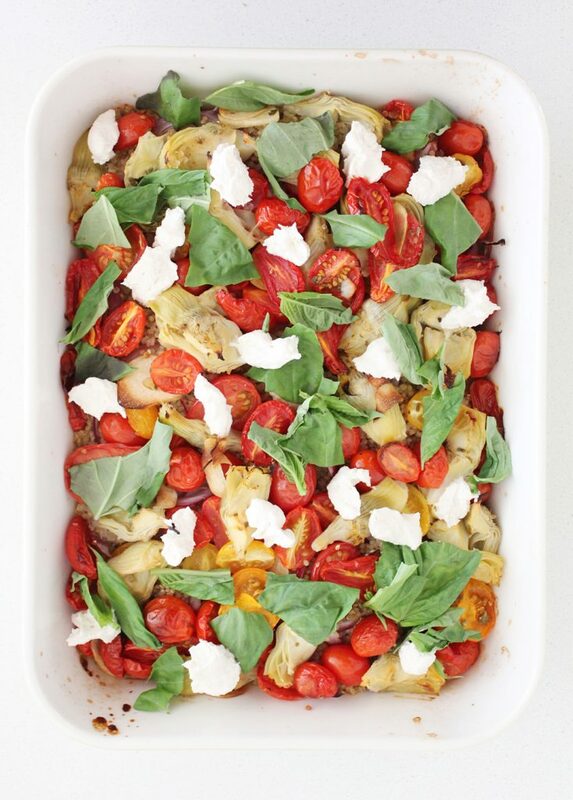 The first thing you need to know about this dish is it tastes like pizza. For real. I’m not that person who doesn’t really eat pizza so I don’t remember what it actually tastes like. I eat pizza, I remember pizza and this tastes like pizza. 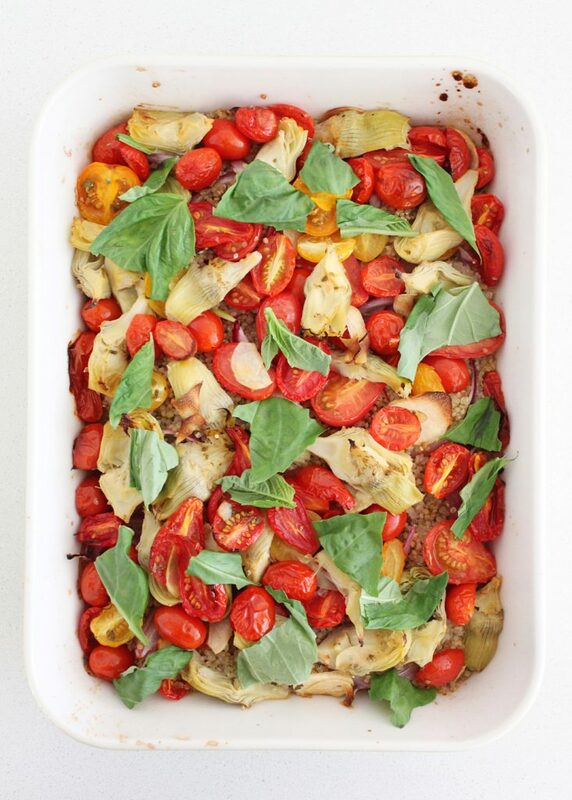 I can’t say what it specifically is about this that gives it the pizza vibe besides just the combo of fresh and dry spices and the tomatoes and artichokes (some of my fave toppings), but you’ll just have to trust me and try it out yourself. The other great thing? 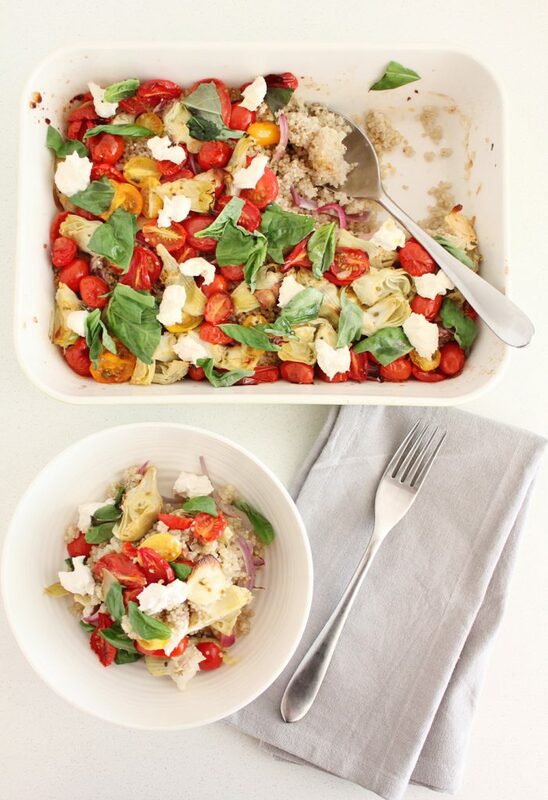 Besides remembering to soak the quinoa, this is an incredibly easy dish to throw together and leave it up to your capable oven to do the hard work. The quinoa cooks in there (much in the same way we do it stove top style here) and the veggies roast, much like they would atop pizza, while creating a ‘lid’ to allow the quinoa to steam. It’s pizza-flavoured science, you guys. Even if you ate pretty well throughout December, January marks the time of changing our focus back to routine, fewer stressful variables and more time for self care, including healthy homemade meals. But sometimes after all of those Holiday flavours, you just feel like pizza. I know this because my husband and I were lucky enough to be in Rome this time last year, and it was the ultimate Holiday palate cleanser. That being said, we came home craving all of the kale salad, but some amazing pizza and pasta for a week was just what the doctor had ordered. So, I give you both pizza…and pasta (sort of?) in the form of something disguised as January ‘getting back on the wagon’ food. 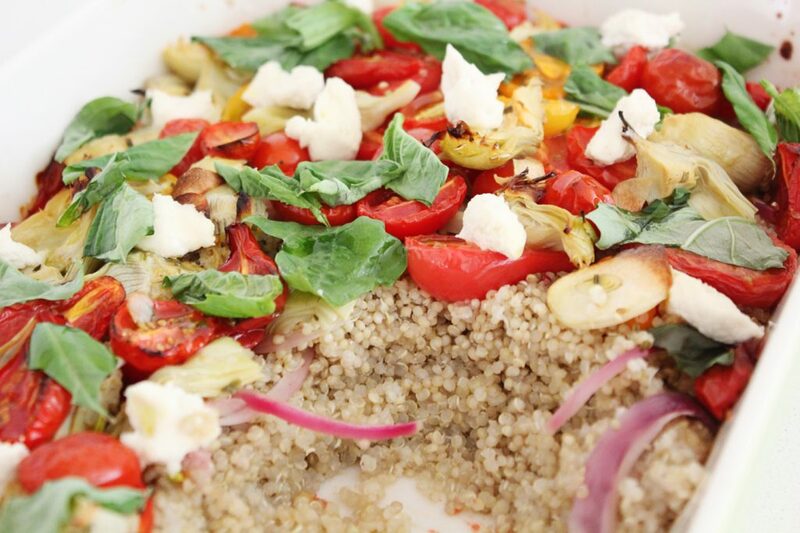 The protein in the quinoa will leave you feeling satisfied, while the pizza-appropriate veggies all play nutritional roles too. 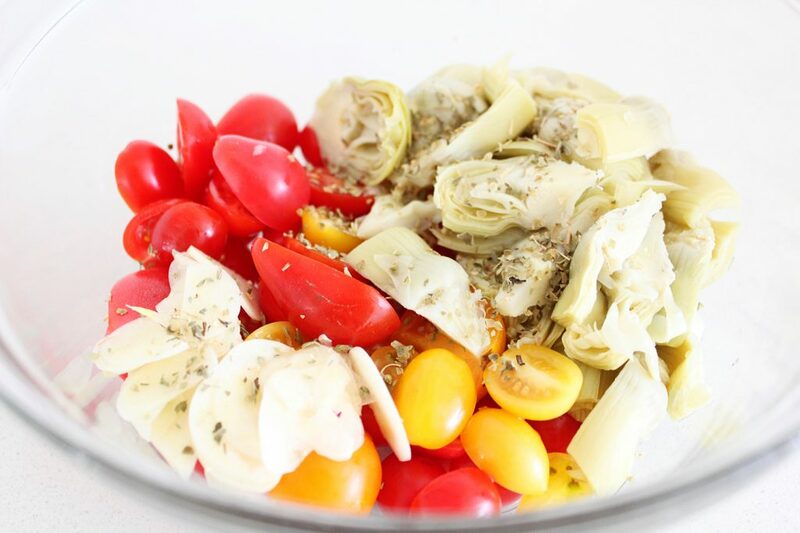 The artichokes support your liver and gallbladder (we used the hearts from a jar but if you happen to make Steamed Artichokes the night before –you should!- make extra and use them in this), the tomatoes boast the well known cancer-crushing antioxidant, lycopene (even more so once cooked) that happens to also be great for your vision. 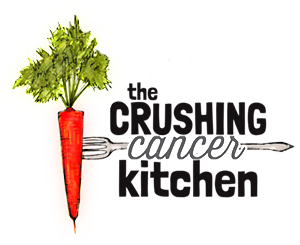 The dry oregano also has antioxidant and microbial powers, as does the fresh basil, which is also warming. 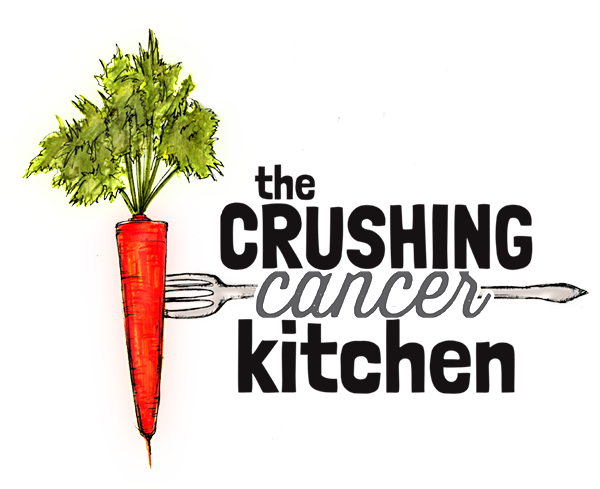 The red onions and garlic are both from the anti-cancer family of Alliums, and happen to taste just totally perfect in this recipe too. If you don’t eat nightshades, you could easily leave out the chili flakes and replace the tomatoes with thinly sliced fennel or mushrooms, olives, shaved Brussels sprouts, or really anything that you would get excited about having on pizza. Just make sure there is enough to at least cover the quinoa so that it steams evenly. The Plant-based Goat Cheese is a decadent addition that I highly recommend, but if you’re short on time or want to skip it, a squeeze of lemon and some thinly sliced avocado once you pull it out of the oven will also taste pretty great (this works well on real pizza too). But if you haven’t ever made this cheese, you really should at some point, it is amazing. 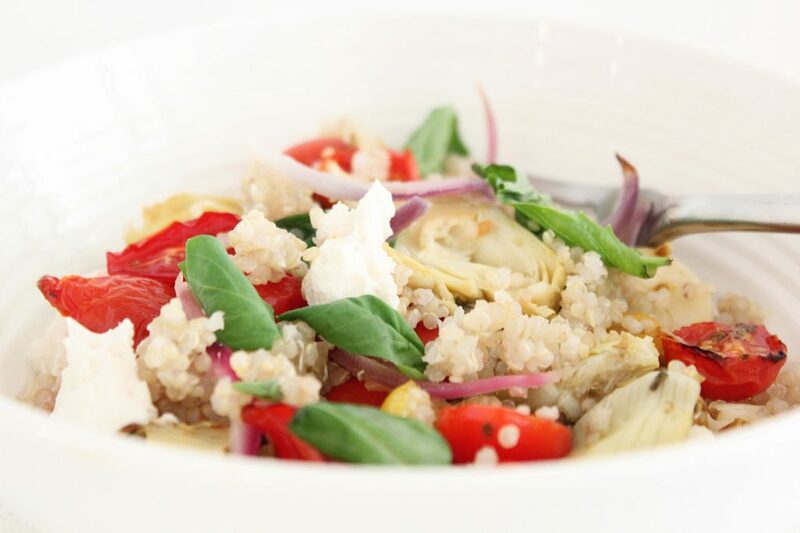 Double up on the veggie toppings if you want a better veg to quinoa ratio, or just serve it with a big Caesar Salad, some Lemony Shaved Fennel or maybe even this delicious Radicchio Dish if you want to pretend you’re in Italy. 1-2 Boxes of Cherry Tomatoes, halved (or diced larger tomatoes) (or thinly sliced fennel and/or mushrooms to keep it nightshade-free). 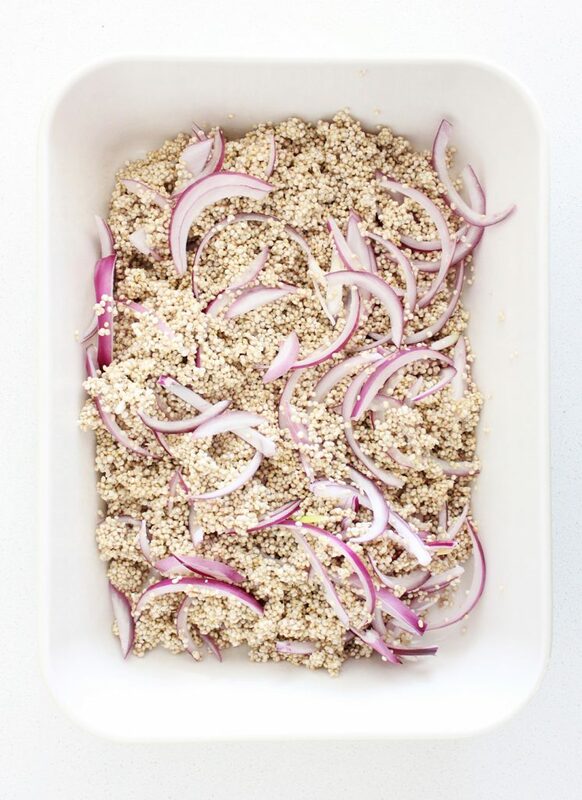 In a bowl, toss the soaked quinoa, red onion and salt together. Spread out evenly in an ovenproof, approximately 8 x 11 inch (28 x 21 cm) casserole dish. 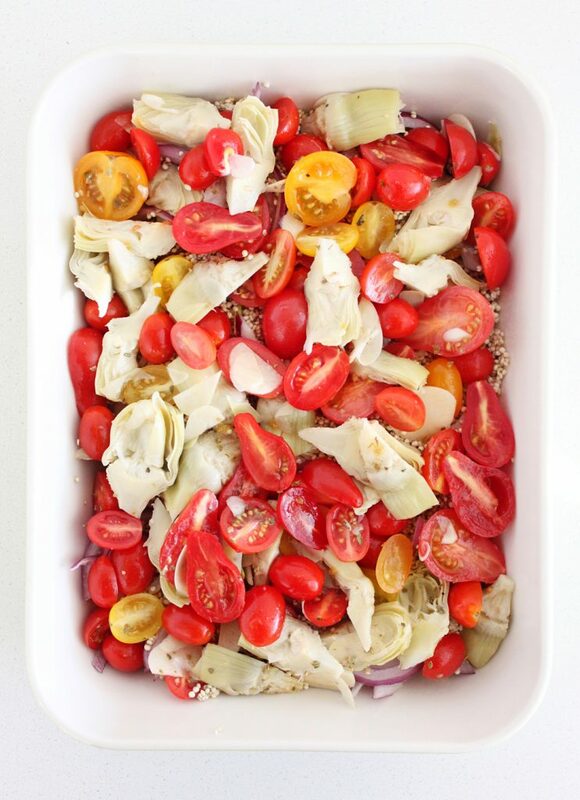 Separately, toss the tomatoes, artichokes, garlic, oregano, melted coconut oil and a pinch of salt together and spread evenly over the top of the quinoa, ensuring that all of the quinoa is covered. Pour the water evenly over top. 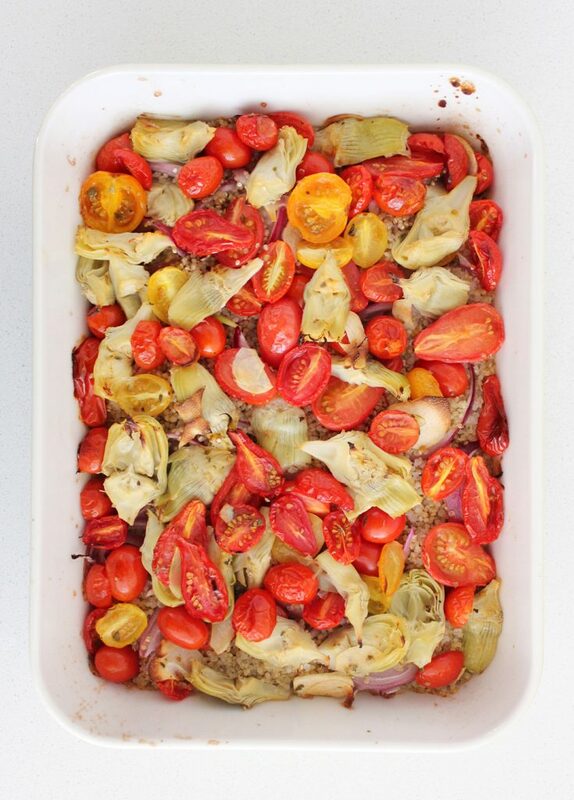 Bake, uncovered for 45 minutes or until all of the water has absorbed into the quinoa. Top with the fresh basil, olive oil and cheese (or a squeeze of lemon and sliced avocado if you're not making the cheese). Great recipe! I baked this tonight and added some mushrooms and used store bought goat cheese (top shelf stuff). It was quite delicious and will definitely be baking this regularly with some slight tweaks such as red peppers and using the whole red onion (I love red onion).